from readers who follow the work of the New Zealand Centre for Political Research. The Taupo Times on 14/11/17 published an article 'Lake Levy is off to Court'. It's about legal action Tuwharetoa are taking to force commercial operators to pay the iwi for licences to operate on 'Taupo Waters' including Lake Taupo, tributaries flowing into the lake and the Waikato River from the outlet of Lake Taupo to the Rock of Tia including Huka Falls. The amount the iwi charges for these licences was confidential but they were described as commercial leases. If enforced by the Court these fees are likely to put a number of smaller operators out of business. A group representing those operating on these waters is trying to clarify the 'deed' that our 1992 government provided and that our 2007 government amended that allows the iwi to charge people to use the space occupied by the water and the airspace above it. At present, recreational users can still use the 'Taupo Waters' for free. Aren't we lucky? For the present. The reasoning underlying these leases raises a question of whether other landowners can charge for using water on their land and airspace above it. I might offer a lease to airline companies that sometimes fly over my house. And to my neighbours for the use of my land by their cat which sometimes walks across it a and makes use of the air above it. Clearly, this trend will vastly improve everyone's quality of life in New Zealand, making life simpler, more secure and egalitarian. Not. I think it is a good idea to help students to avoid huge student loans which often do not get paid back. BUT how stupid to do this for the 1st year of study. This should be for the last year and used to pay back part of the student loan. Any young person could register for a free first year, enjoy themselves, do no work and drop out at the end of that. It is a waste of public money. Well, now we have an answer – and some questions. The Chinese takeover of our country will be deferred but the Chinese are patient people. All they had to do to get Hong Kong was wait. The National Party will be licking its wounds and wondering what it did wrong and some right-wing commentators will be angry. And did it matter that we had to wait twenty-six days? Not a bit. Winston Peters’ reasons for the delay were legitimate. And did you notice? No lengthy peroration in “Te Reo”; not a word. After the Maori pantomime of Passchendaele that was a relief. It was a moment for plain speaking in plain language, in English. The Prime Minister-elect has promised to govern for “all the people of New Zealand” - an echo of the Treaty of Waitangi. She may find it difficult. We had, too, an opportunity to examine closely the features of deputy Labour Party leader, Kelvin Davis, MP for a Maori electorate. Is there a trace of Maori in his appearance? Given the dominance of the Polynesian phenotype – people look more that way than they are – Maori must be a small part of his ancestry. It reveals the mockery of the current definition – that any claim to Maori ancestry entitles one to be so classified – and so partake in the benefits available only to Maoris. What is the chance that the new government will change this? And will an unusual, perhaps unique, three-party coalition hold together for three years? Will an unholy alliance of Maori electorate members, comfortably seated despite Winston Peters’ “bottom line”, and the Green Party form a determined pressure group? The latter, after all, are committed racists, having sought to remove the right for a ratepayer poll when a local council has sought to appoint unelected Maori members. In the secrecy of Svensmark's alternative cause of global warming is getting increasing traction despite a strong rearguard action by the carbon shroudwavers. On consideration of the spiky changes in temperature and lagging carbon dioxide over the last four glacial cycles and half a million years coupled with the slow and steady rise in sea level over the last six or seven thousand years I find Svensmark much more plausible. It is indeed the sun and not carbon dioxide that drives our climate. The magnetic fields of both the sun and the earth wax and wane rapidly. They control the flux of charged particles reaching the earth from space. At times of low magnetic field more charged particles reach the earth. Each charged particle forms the nucleus for the formation of a cloud droplet. Increased low cloud results in increased albedo and decreased solar radiation reaching the surface. Thus cooler conditions arise. The magnetic fields of both the earth and sun are currently waning. Thus we can expect cooling even while model predictions based on carbon dioxide take off towards the stratosphere. I have been surprised and very concerned at how little has been done to hold Metria Turei to account. Not out of vindictiveness, but out of real fear of the consequences of not holding her to account. In promoting the Green party’s social policy, she informed us she had committed an ongoing benefit fraud as a solo mother. Then she said (paraphrased) if they prosecute me I will pay it back. Knowing what she stole, why is she waiting for prosecution before returning it? Life’s not hard for her now on a party leaders’ salary. What concerns me hugely is the message she is giving; to justify herself she says, blinking earnestly to the camera, “it was hard”. I don’t doubt that it was hard, so the message to beneficiaries (or anyone else who finds it “hard”) is; if it’s hard it’s OK to commit fraud. It’s not a big step from there to, if it’s “hard”, rob a dairy, or rob someone who’s got more than you. So here we have a person who leads a significant political party and aspires to be a cabinet minister, effectively promoting and encouraging benefit fraud. A supposed role model to our young, as a Maori, a role model to the young in the Maori community. Is that the message that should be going to those people, going to us? It is not; and we cannot afford to have that message being given, the consequences are too serious. If she was in politics in Britain, the home of our Westminster style of government, she would have been gone before the echoes of the interview had faded. There is only one option for her, resign. She has shown herself unfit for office, not for the theft, but for the underlying attitude, and supremely, effect of that attitude on the community and on her ongoing decision making. In the secrecy of darkness,Immigration Matters. “A view point”. One has only to see the problem Auckland now finds itself in, mainly with this almost uncontrolled entry of immigrants; especially when the present world is poised on the edge of a new robotic industrial and commercial employment revolution. Immigration such as now happening in Western Nations and especially in this country needs a careful re-assessment, otherwise we will see a return of the long despised but true Malthusian theory re-emerging as a controversial front line problem. A theory which still haunts those in the corridors of power! Also the extra costs that will be placed upon our society will demand a new thinking in terms of increasing our exports to pay for the new infrastructure. As agriculture is so despised and blamed for so many ills by the Green Lobby, any increase will further their fury and misleading rhetoric. It is obvious that they remain totally silent on any possible alternative, if indeed they think that far ahead! Add this to the constant requirements by the many fractions of our public for more resources mainly into social issues, with a complete disregard for either central or local government finances. Then there are the ethnic problems posed by the almost unrestricted entry of refugees into New Zealand and the threat which comes with the entry of Muslims into our community. Terrorism does not necessarily come from the first wave of these immigrants, but as in the U.K. and France from their descendants; proving conclusively that they do not assimilate like other immigrants into the existing community. Just how can they, when their religion (Koran) demands the elimination of non-Muslims? Why do our Parliamentarians in this country in concert with other Western Nations continue with a policy in accepting Muslims in greater numbers? Seemingly humanitarian concerns promoted by the United Nations (safely ensconced in their New York Ivory Tower) override the realities of future conflicts. The United Kingdom and Europe already has its fair share of problems with Muslims; ranging from a terrorist-sympathising Islamic Mayor to frequent terrorist attacks committed in the name of Islam. New Zealand has seen to date, very little of the scale of terrorism that has been experienced in other countries, but one can but wonder, just how long this fragile peace will continue and what messages to the faithful emanate weekly from Mosques in this country? Just how long will it be before the dreaded Shari law is established into this country along with the other practices? It was laughable decades ago to think that Western Nations would ever have enclaves dominated by a particular sect or religious group, and more importantly due to the weak apologetic political non-action and failure to inform of the consequences that these groups now pose in demands for their own religious laws. Which has resulted into areas in which Common law and Justice is no longer valid. Already in Australia they have felt the growing Islamic independence in the demand for private areas in which Muslim men can express views (and no doubt anger) which are not acceptable in a democratic society. With another election upon us concerned mainly with internal issues and the race to handout more financial sops to ensure political votes, it is doubtful whether any politician will have the time, the resolve, the courage, or indeed the intestinal fortitude to raise the actual issues of Immigration. I would love to see some informed discussion around this: There has to be a limit on the number of children coming into a household where the parents cannot afford to look after them, or cannot do so without our help. You talk in one of your articles about tinkering around the edges with kid gloves - every single social ill in this country could be helped by more considered family planning. In this generation and those to come. In the secrecy of darkness, the Treaty of Waitangi and the Declaration of Independence were moved from the Constitution Room at Archives New Zealand to the new He Tohu exhibit at the National Library, Wellington and the people of New Zealand deliberately deprived of their true history by separating our vital constitutional documents. The Declaration being an unauthorised failed attempt by James Busby to have tangata maori sovereignty of New Zealand recognised with only 52 signatures. The Treaty signed by 540 tangata maori chiefs confirming sovereignty over all the island of New Zealand to Britain and gave tangata maori, “The same rights as the people of England”. No more, no less. Six months after the treaty was signed, Queen Victoria’s 1840 Royal Charter separated New Zealand from New South Wales dependency on the 3 May 1841 with its own Governor and Constitution to form a government to make laws with courts and judges to enforce those laws, irrespective of race, colour or creed. Queen Victoria’s Royal Charter, our true Founding Document and first Constitution was held in the Constitution Room at Archives New Zealand, but has been moved to Archive’s repository, where it will soon be lost amongst the other 6 million documents. The Government had no right to separate our Constitutional documents as they belong to all the people of New Zealand. Mr English, to separate our Constitutional Documents to appease Maori is corrupt in the eyes of the majority of New Zealanders. As an ex South African I am horrified at the Apartheid Policies being introduced in New Zealand. Where are the "protestors" and flour throwers now? Maori sports teams, separate Maori schools, Maori "protected" seats, Maori vetoing rights, Maori TV channels and a lot more. Good grief! Where will it end? Get rid of the undemocratic MMP system and the "tail wagging the dog" will change. Let's have a Chinese TV channel funded by the Govt? Mmmmm! AND perhaps the Queen should be making the apologies and handing out the "sorry" money! Were many if not most of the atrocities visited upon Maori not of our erstwhile ruler's making? On 18 May 2017 StatsNZ announced that “Ethnic diversity projected to rise.” Smile. Greater ethnic diversity could progressively render Rotorua’s divisive politics of biculturalism obsolete. New Zealand’s population is projected grow by about 1 million in the next 20 years. The ‘European or Other’ group is projected to drop from 75 percent in 2013 to about 66 percent in 2038, mainly due to its older age structure. Over the same period, ethnic groups with higher birth rates or higher migration gains will increase their share of the population. The Māori ethnic population is projected to rise from 16 percent to 18 per cent of the population. The broad Pacific ethnic group will increase from 8 to 10 percent. The broad Asian ethnic group, including Chinese and Indian, will almost double, from 12 to 22 percent. Assuming similar trends in Rotorua, the dramatic rise in ethnic diversity is likely to undermine support for co-governance driven by a politics of biculturalism, and encourage the development of a multicultural and pragmatic appreciation of legitimate political interests. We should welcome such a trend because it would increasingly value interculturalism as a pathway to peaceful policy settlements, especially pragmatic solutions built on the common ground in the public interest. It would illustrate the principle that democratic governance and equal human rights of all citizens are essential components of sustainable development and lasting peace. Just because NZ has more water than needed is no reason not to charge for that being on-sold for commercial gain. Private consumption use water, or water being used in production like factories or farms etc, should all remain free. BUT, any water being on-sold locally for drinking as plain, sparkling or flavoured water like Coca Cola Pump brand water or any water being exported overseas by whoever does it should be sold only on condition a NZ Govt Agency provides pumps, buildings, pipes and processing required to supply the water to who ever wants to access it. Then that Government Agency can introduce exorbitant charges for processing the water before commercial organisations get their hands on it. In exactly the same way our local councils do. It can then be claimed we are not charging for the water, only for processing it. If Local Councils are getting away with doing this, why can't Central Government? Dr Paul Moon (and his supporters) should be given every encouragement to fight the evils of the “politically correct” (PC) ideological sledgehammers. Few would know nowadays that Vladimir Lenin defined PC tenets in detail in 1921. The purpose of his fight against “political incorrectness” was to stifle democratic debate within the Bolshevik Party by forbidding the use of certain words and thoughts. So too do the pushers of modern day PC wish to clobber those that disagree with them. Does the desire to crush opposing thoughts mean that we should all sign up to the sport of squash? To examine some glaring faults in PC doctrine, one can look at the following two aspects: First that it is racist to say negative things about minorities, but quite alright for minorities to utter racist slurs against the majority. And, secondly, that we must respect all other cultures: Does this mean that we must approve of female genital mutilation? Of course not. Many of our modern-day problems arise when politicians are too cowardly to stand up to PC blackmail. This year is election year, use your voting rights wisely. Where is our free speech? Freedom of speech applies only to minorities and radicals it seems who can voice their indignation at anything they consider offends their points of view and is more often than not backed up by the wishy, washy comments from Susan Devoy and her ilk and coterie of hand wringing apologists for everything. There was a time when true environmentalists strove to protect wild things. Now the green shirts have become enemies of the environment by pushing green energy and demonising the building blocks of life - carbon and carbon dioxide. Its way past time for New Zealanders to stand up and celebrate their culture. For those of us who have travelled and worked overseas it is a diverse and tolerant culture that should be celebrated and what more appropriate time than the one we finally became an independent nation. I want to see as celebrate for a week from November 27th when in 1947 the Statute of Westminster was passed by our parliament thus making us no longer a colony of Britain. The days holiday that we get for the day of protest and rebellion called Waitangi day would become the Monday of that week but the week would start on the 27th. Some schools could spend two or three days celebrating and teaching the complete history of our version of Western culture - from Greece and Rome ,through the British Empire and the exploration and linking of the world, to how Polynesians spread across the Pacific and we joined together to bring peace and prosperity to all. All the contributors to our Kiwi Culture would contribute to the week but the underlying theme would be one of togetherness and shared nationhood. Radical extremists could spend the week locked up in specially created camps so they did not disturb the rest of us. Any who persisted year after year in creating a problem could be sent back to their homeland - America, Hawiiki, China or where ever. Tax Avoidance by Maori Trust, Trading Companies, Charities. Does anyone, in particular the IRD audit these criminals and ask the question. Where did you spend $24,300,000 and on what in New Zealand? Answer is in fact. We sent all the profit to our Head Office in NSW, Australia. These Religious saints are in fact dishonest criminals.....and we (NZ tax payers) allow them to operate. There is no excuse for people such as Sir Geoffrey Palmer, our leading Constitutional Lawyer ignoring Queen Victoria’s Royal Charter/Letters Patent. Surely they are not that ignorant of how New Zealand separated from New South Wales and became an independent British Colony with its own political, legal and justice systems. They must have known the Treaty of Waitangi only placed New Zealand under the laws and dependency of New South Wales for only twelve months. The Government, including Te Papa and our new Governor General Dame Patsy Reddy should know better than to refer to the Treaty of Waitangi as our “Founding Document” and “A partnership between Maori and the Crown”. While the Treaty of Waitangi gave Britain sovereignty over all the islands of New Zealand and tangata Maori, “the same rights as the people of England”, it was not our “Founding Document”. It was an “agreement”, not a “partnership” between tangata Maori and the Queen. Fact! After each tangata Maori chief signed the Treaty of Waitangi on the 6th February 1840 at Waitangi, Lt. Governor Hobson shook their hand and repeated the words “He iwi tahi tatou – We are now one people”. Tangata Maori became British Subjects and British Subjects cannot be in “partnership” with the Queen or the Monarchy. Fact! The Treaty of Waitangi placed New Zealand under the laws and dependency of New South Wales, therefore was not our “Founding Document”. At the time the Treaty of Waitangi was being signed, Britain had no idea of whether it would gain sovereignty over the whole country or only parts of the country. Britain could not make any formal plans of how Britain would rule New Zealand until Britain knew the results of the Treaty, so temporarily place New Zealand under the laws and dependency of New South Wales. Once Britain found over 500 North Island chiefs had signed the Treaty, sovereignty over the North Island was declare by Treaty and over the South Island by discovery as virtually the whole of the South Island had been sold by the chiefs travelling to New South Wales to find buys. Over 700 Deeds of Sale still remain in the New South Wales Supreme Court. Britain declared sovereignty over all the islands of New Zealand on the 21 May 1840 under the laws and dependency of New South Wales, therefore the Treaty was not our “Founding Document” as New Zealand became part of Australia on a temporary basis for twelve months until Queen Victoria’s Royal Charter/Letters Patent dated the 16 november 1840 was enacted on the 3 May 1841. The Treaty of Waitangi was never intended to be our “Founding Document”, it was solely to find out whether tangata Maori would give up their sovereignty to Britain and become British Subjects under British rule. Over 500 tangata Maori chiefs signed their names or marks for them and their people to become British Subjects under British rule of one flag and one law under the temporary dependency of New South Wales. Once New Zealand had been declared British Sovereignty, Britain had to decide whether New Zealand would remain part of Australia or become a separate British Colony. From 21 May 1840 until the 16 November 1840, the British Parliament debated whether to leave New Zealand under the dependency of Australia or become a separated British Colony with its own Governor and Constitution to form a government. This could only be established by Royal Charter. Fact! On the 16 November 1840, Queen Victoria’s Royal Charter/Letters Patent separated New Zealand from New South Wales with a Governor and Constitution to form a government under one flag and one law, irrespective of race, colour or creed. Queen Victoria’s Royal Charter/Letters Patent was our true “Founding Document” and first “Constitution” as it separated New Zealand from New South Wales and made New Zealand into an independent British Colony with a Governor and Constitution to form a government to make laws with courts and judges to enforce those laws under one flag and one law, irrespective of race, colour or creed. The government, its agencies and Te Papa our National Museum have for some reason deliberately keep Queen Victoria’s Royal Charter/Letters Patent from the People of New Zealand, completely ignoring it in favour of the Treaty of Waitangi. But is so doing have racially divided the People of New Zealand into Maori and non-Maori that was never intended by those that signed the Treaty in 1840 with the words, “He iwi tahi tatou – We are now one people”. Without Queen Victoria’s Royal Charter/Letters Patent, our “true” Founding Document and first “Constitution”, New Zealand would have remained under the laws and dependency of New South Wales without a “Founding Document” or its own “Constitution”, but the British Parliament decided to separate New Zealand from New South Wales and make New Zealand into an independent British Colony on the 3 May 1841. The day we should all celebrate as our “Independence Day”! It is over to the People of New Zealand, both Maori and non-Maori that they honour our ancestors wish in 1840 to become one people under one flag and one law, “He iwi tahi tatou – We are now one people”. Not allow a few self-appointed Maori leaders and a past Governor General, the Rev Sir Paul Reeves to threaten the government with violence and/or a civil war if Maori did not get their own way. ABC TV Four Corners Programme called “Trick or Treaty” screened in Australia on the 5 March 1990. It’s correct, 2/3 of NZ was sold by the chiefs before the Treaty was signed. Many Deeds are still held in the New South Wales Supreme Court, but the return of this land was done after New Zealand became a British Colony in its own right through Queen Victoria’s Royal Charter. Until the Royal Charter is recognised as our Founding Document that set up a government with a political, legal and justice system in New Zealand, then the whole system will remain a shambles! All our political, legal and justice systems had to be in accordance with the Constitution provided by Queen Victoria’s Royal Charter and examined/OKed by the British Parliament, but without recognising Queen Victoria’s Royal Charter we will never sort out exactly what happened at this time. It’s unbelievable how all governments have continued down this path without acknowledging the Royal Charter. This can only be taken as a criminal act by those involved that should have known better. Governments have lead New Zealand up the garden path to end up where we are today, “A complete bloody shambles” that must be sorted out by first recognising and adopting the Royal Charter as New Zealand’s true Founding Document and first Constitution. The Treaty had nothing to do with what happened in New Zealand after 21 May 1840 as we were under the laws and dependency of New South Wales until the 3 May 1841. After the 3 May 1841 Queen Victoria’s Royal Charter gave New Zealand its own political, legal and justice systems, irrespective of race, colour or creed, but under the watchful eye of Great Britain. Fact! Complied by Ross Baker, Researcher, One New Zealand Foundation Inc.
Why is so much important material published here that never reaches the wider media? Much of your material is of vital interest to all New Zealanders but all our papers and TV serve up is trivia. One can be excused for thinking that it is part of a deliberate policy of "dumbing down." Anyone following Fox News during the lead up and following of the USA elections would have noticed our comparative declining political freedoms, due to get worse for the US under a Hillary rule. The frenzied left wing and feminist reaction to the Hillary loss is happening here. Nothing will change here under Labour or National, they won't repeal bad laws because they need the votes of the lunatic fringe to stay in power. Since D. Trump stood for President of the United States the major media outlets in New Zealand have forged an Anti Trump campaign. Taking the NZ Herald as an example, when last did you see ANY article assessing the Trump and Republican campaign as anything but detrimental to the future of this planet? The main examples of bias journalism in the NZ Herald emanate from the many articles from the Washington Post and the Democratic outlets; they must be freebies that help the left liberal media in mounting a campaign of anti Americanism, based upon previous decades since the era of David Lange. Recently we have seen the disgraceful reporting in our Media on the involvement of this country in the Security Council's adoption of condemning Israel and promoting Arab Muslim extremism under the guise of Palestinian demands. Totally ignoring the historical facts that since the inception of the State of Israel numerous attempts have been made and are still being made to destroy that country. One would have thought that with Iran's outspoken demand to eliminate the Jewish Race, the Security Council would have at least dealt with this new attempt at a "Holocaust" . With only a few days to go President Obama will be an ex President, and his legacy of appeasement hopefully finished, no doubt our liberal left will consider his disappearance as a type of martyrdom of their cause. Whether Donald Trump will make America great again lies in his next term of office. Rather amusingly our new P.M. is courting the E.U. for greater trade opportunities, just what does he expect an opening up in Europe for our agricultural products? He had better look at whether we will have any agricultural products left to export, if the Greens continue their indoctrination; with of course, the help of our media in the campaign of "Farmer Hatred'. There's a lot wrong with a country which stifles freedom of speech, opinion and expression. Sir Peter Leitch should not have apologised for stating a truth and should have, on behalf of the country, allowed the courts to prosecute, highlighting an undemocratic law. You only further an accusers beliefs by bending to them. Individuals need to harden up. Water is a public resource and should not be owned by anyone. The management of this should be by a group which is proportionally representative of all the races who now hold citizenship. I do not know of another country where water is "Owned" by an indigenous race. The Maori were not the first people here and therefor have no more right to ownership of the water than the rest of us . How many so called pakeha have maori blood? How many full blooded Maori are left? I suspect none. It's time for us all to work together in harmony to protect all our resources and manage them sensibly for the future together, I myself am married to a part Maori and therefore our children are too. I am not anti-Maori - more pro NZ. Claims by Maori for the water rights is yet another add on which Maori have exploited ever since Key's Government has pandered to them so as to stay in Government. Key and his arrogant team will sell themselves to whoever will help them to stay in power but the whole sad point of this is that the "Kiwi" in general will just go with the flow.Whatever happened to the real Kiwi who says we are all Kiwis and all decisions are for all Kiwis? Both the Maori and English treaties of Waitangi were between tangata Maori and Queen Victoria for Britain to gain sovereignty of all the islands of New Zealand but over the years there has been ongoing debate over the wording of both documents. Unfortunately, people fail to read the Preamble, which in any document explains the clauses of a document if they are ambiguous or not fully understood. The Tiriti o Waitangi states the word, “Kawanatanga” and there has been ongoing debate whether it means “sovereignty” or “governorship”. The Preamble of both treaties state, “To all places of New Zealand which may be given up now or hereafter to the Queen”, therefore, this can only mean “sovereignty”. (Official translation of the Tiriti o Waitangi for the Government of the day by Mr T E Young of the Native Department in 1869). Maori also call themselves “tangata whenua” but the Tiriti o Waitangi states 3 times, twice in the Preamble and once in Article 3 that the people who signed it were “tangata Maori” and not “tangata whenua”. Over 500 “tangata Maori” chiefs acknowledged, accepted and signed the Tiriti o Waitangi as “tangata Maori”, not tangata whenua or the Indigenous People of New Zealand. It was the “tangata Maori” that were given “The same rights as the people of England” in Article 3, not “tangata whenua” or the Indigenous people of New Zealand, they had long gone. While Article 2 of the English version does not mention “all the people of New Zealand”, both Treaties state, “Tangata Maori would be give the same rights as the people of England…….. to their lands, their settlement and all their property”. Once the Treaty was signed, “all the people of New Zealand” came under the dependency and laws of New South Wales under one flag and one law irrespective of race, colour or creed. Queen Victoria’s Royal Charter/Letters Patent dated the 16 November 1840, our ‘true’ Founding Document and ‘first’ Constitution confirmed the above when it made New Zealand into a British Colony with its own Governor and Constitution to make laws with courts and judges to enforce those laws, but still under the watchful eye of Great Britain. On the 26 September 1907 New Zealand became the Dominion of New Zealand with complete self-government by proclamation of King Edward VII. New Zealanders became British Subjects with British Passports. In 1947 New Zealand adopted the Statute of Westminster that gave New Zealand complete control over its domestic as well as its foreign affairs and all the people of New Zealand became New Zealand Citizens with New Zealand Passports. Three long debated questions answered by one simple document, the Treaty of Waitangi. Who would have guessed it was so simple after so many years of debate and so many books written! So when in doubt – Consult the Preamble. ‘Politics is the only profession for which no preparation is thought necessary’. R.L. Stevenson. Some years ago the then Rodney District Council was replaced with a commissioner because it had become dysfunctional. In 2012 the Kaipara Council was replaced for similar reasons. Now, by most accounts, the Auckland Council is in a mess. And this is just in the north. It’s unlikely that all other municipal and district councils in NZ are doing OK. I know of a couple that are. They should be used as models. So what’s the problem? It has been suggested that there is so much red tape these days councillors and board members are bogged down in minutia and have no time to do what they were elected to do - look after the needs of residents and ratepayers. I see that as an easy excuse for poor performances by councils and boards. Elected people should be able to cope with it. It’s akin to saying top rugby players can’t be expected play well because of the rules. And therein lies the real problem with local government. Many elected people are not top performers. Many have no business experience of note, no relevant academic qualifications, no management skills, no proven leadership ability and not much imagination. A lot are simply well intentioned folk who 'think' they can hack it in local government. Add to these weaknesses in the system the fact that a handful of councillors or board people have to ‘joust’ with (in the Auckland case) thousands of bureaucrats, many of whom are well-practiced sharp operators (and many not), and the elected folk have no show. So what’s the solution? We need to do things differently. All aspirants for public office should produce a comprehensive CV outlining their record and achievements as above - including any past indiscretions or misdemeanours. Many of the CVs I’ve seen are a couple of paragraphs of tripe. Psych and IQ tests, as are conducted in the private sector, would be useful. There need to be public debates on local issues (as is done for General Elections). The problem there is that only the few stalwarts that attend such things turn up. Sadly, radio and TV aren’t that interested in covering them. A good way of ‘probing’ aspirants is to send them letters, not emails, asking for their views on local issues. Ideally, a selection panel (of residents and ratepayers) should assess aspirants, rank them and publish the results. That might stimulate a bit of interest from the general public which has little enthusiasm for local government - as voter turnouts show. The worst way of doing things is to have public meetings where aspirants have two minutes to say how ‘wonderful’ they are, are asked a few tame questions and sit down. Another key to better performance by councils and boards is for them to seek advice from experts and successful business people in the private sector rather than assume an air of superiority and omniscience… and screw up! For sure, so long as we keep doing things the way we have done them for decades we shall continue to get failed mayors, councils and boards. John Clements is a retired pilot based in Orewa. Re: "Whatever this is, it's not democracy", Karl comments that elected councillors are still in the majority where there are appointed race-based seats, but this situation is severely weakened by the use of sub-committees. In Super Silly Auckland, these smaller groups review all the materials pertaining to really important issues and then make their recommendations to the full council just for sign-off. With Lecherous Len appointing the Chairs and each sub-committee having one (or two?) unelected, self-interested Maori voting on them, they are easily manipulated. Then there's the issue of the gross waste of ratepayers' funds. Aucklanders are paying for an internal Maori Department as well as the external "Independent Maori Statutory Board" which simply must be housed in the flashest part of the CBD on the waterfront - at ratepayer expense. The continual rip-offs are demonstrated by this one story: Willie Jackson couldn't get 'selected' onto the IMSB gravy train so he took his case to the High Court which found in his favour in 2015. The IMSB wasn't going to give in easily to any sort of democracy, so they appealed the decision (which they lost) and their Tame Te Rangi threatened Auckland Councillors with personal legal action if they didn't use ratepayers' money to pay for the legal fees. Te Rangi sat in on the Council vote (27/8/15) to "advise"; the funding was approved by 9 votes to 7 (and no extra marks for guessing which way the 2 IMSB members voted!). So bottom-line: race-based appointments to voting seats opens the doors to legalised corruption. They must be resisted at all costs. Your article on the childrens' commissioner and child poverty is so absolutely correct its almost ridiculous that the rabid social reformers of N.Z. society, many of whom sit on the parliamentary benches can not see the truths in it. The same thing is happening all over the Western World. The foundations which made them what they are, are being destroyed. How can they just live when the foundations have been destroyed. Those that proclaim them will be attacked. Thank you for the work you are doing, I believe it is vital to the preservation of our Nation. I only wish you had a greater exposure to all of N.Z. . I totally agree with your concerns about the Governments apparent move to relinquish control of water, to a minority Maori Elite. It is outrageous, a reverse apartheid stance, discriminatory, and beyond belief. Any Government that even contemplates this, has lost its right to rule the country. My vote will certainly go elsewhere , to any party that opposes the Government in this issue. Maori should have no control over fresh water management (except that which they have been given under their Treaty settlements). This is a demand for money. A trade off for whatever they gave the National Party. Will increase costs to all water users and add time to water management issues. The elected regional councils should decide these issues with minimal consultation with local iwi as fhe council sees fit. If the Treaty of Waitangi was an agreement between the British authorities of the time and all Maori of New Zealand, why is it that today we do not have representatives of ALL Maori tribes involved in deciding the official agenda of Waitangi Day. It appears that the Maori people are no closer to being united within New Zealand society today than they were when the Treaty was signed. Apartheid has not worked anywhere in the world, so why is our elected Government allowing ever increasing separatist policy issues to become law in New Zealand ? Will this become the major issue for the people of New Zealand in the future ? If so, then what about the pain it will create when it unravels ? It NEVER stops. When will someone in Government grow the balls to say Enough is Enough? We are supposed to be one country, reconciling from the past and moving forward as one. Yet every time we look around the government has approved another "separatist" type program whereby Maori and non-Maori are treated differently or dealt with at a different venue/facility. It's through schools now, universities, hospitals and many other government programs. As we speak - this government is forcing separatist policies on our Nation and in doing so, relinquishing control and providing Maori their much wanted Sovereignty by stealth! Am I the only one who sees the insanity of this situation? Can anyone remember what momentous event took place on 1st December 1955? If you guessed it was the day Black American Rosa Parks refused to sit at the back of the black/white segregated bus in Montgomery City, Alabama, USA. Probably one of the most important days in black/white Civil Rights history! Now - what have we learned since 1955? Sixty years have now passed since this day but we seem to have learned nothing. All Rosa Parks, and then later people like the great Civil Rights activist Martin Luther King, were fighting for was EQUALITY and INTEGRATION - blacks and whites (and all others) integrated as one. Equality for all. These incredible people of history were prepared to die for a day when the colour of a person's skin did not dictate or influence the way the government and society would deal with them. They did NOT want separate sections of the bus, or separate toilets or separate water fountains! Yet here we are in 2016 in a supposedly first world country - one of the very best in the entire world and we have people - and much, much WORSE, a government, intent on doing all they can to once again treat us DIFFERENTLY based on the colour of our skin and/or race, ethnicity or whatever! We need to call this for what it is - It's absolutely apartheid and its NOT progression - it's regression towards a separatist state. It's insanity and it's affecting us all. It is time the huge majority awoke from their slumber and spoke out for truth and common sense. They must lose their usual mute and apathetic state and make their feelings known to those who can make a difference. We are all dying here - the death of a million paper cuts. A few a day - but they are growing and the fight is being lost before our apathetic, blind eyes! Wake up people! I have written three letters,to MP Craig Foss asking for an assurance that the government is not about to enable Maori to obtain control of water rights through the Regional Councils. In reply to the first his his electorate secretary wrote rejecting any such government direction saying that the rumor had been around for a long time and there was no truth in it. The last two letters, requesting a personal assurance from Craig Foss have not been answered.. I guess he is busy over the summer break! Thank you for your regular helpful articles, both from you and other contributors. Just a brief comment on the article FORGET THE CHRISTMAS STRAW MAN – TACKLE A REAL PROBLEM by Brian Rudman. He refers in his article to the "karakia at dawn" custom as a Christian custom, while in your article it is referred to as an aspect of Maori spirituality. To the best of my knowledge the "karakia at dawn" is not a Christian custom, but a Maori custom. The fact that some aspects of Christianity or Biblical terminology may have included does, in my view, not necessarily make it Christian. I am interested to have your comment on this, at least apparent, contradiction. I am currently in Thailand and worked here 1980 to 1998 and lived here off and on since. Christmas is always "up and running" in this "Bhuddist" country, the trees, decorations, Xmas carols in major shops, and even the "girlie beer bars" are decorated, not only the foreigner owned ones but Thai owned too. Susan Devoy is an idiot and should be taken off the taxpayer funded payroll immediately. There is nothing more abhorrent than race base privileges and those Maoris that insist on them. 'The Surrender is almost Complete'. Onya Doc. Your Orewa Post. Every sentence, a nail driven home. Hobson's Orewa moment was 4 words. "Now we are one." That's all we need. To waiver from that core understanding is to incubate excuses and ugly bias. The soul sisters of unrealised potential. Regardless of my skin tint. In our country of abundance and boundless opportunity if it isn't happening for me, it's down to me. This is great news because the person best placed to make everything ok for me is the one that cares the most about me, me. "I love me" is a pretentious thing to say yet a crucial belief. It is only when I do that I can share my true self and honestly love another. People that think highly of their humble selves don't throw babies against walls. It's beneath them. So often it seems an impossible dream, Lennon was right, all we need is love. One of the mantras of the "child poverty" message is that they have to go to school with no raincoats and no shoes. Now I realise that there ARE children who are in poverty. However, I grew up in Takapuna, and we practically ALL went to school in bare feet. I hated having to go to Auckland, because I then had to wear shoes. (We did wear raincoats, but I hated them - I notice that students in, for example, Rangitoto College regularly go to school without raincoats). And this was not just in the sub-tropical paradise of the North 'Shore, I can recall going on holiday in winter to a Waikato farm, still in bare feet. In her recent blog post, Lindsay Mitchell states that the damning report into Child, Youth and Family did not go far enough in addressing the plight of unwanted, neglected, and abused children. May I go one step further and suggest that the report itself represents a colossal waste of taxpayer dollars when we consider the fact that: it simply underlines what we already know, namely that the State is no substitute for a loving, stable family (far from it, it seems); it overlooks the proverbial elephant in the room, namely the disastrous (unintended?) consequences of the sexual revolution? May I also suggest that only when we turn back the clock on this radical social experiment gone wrong will we save a great many of these children? Until then, CYF, despite the noble intentions of its personnel, will continue to be the proverbial ambulance at the bottom of the cliff. Water is a necessity for all life, and no one group or class of persons, cultures or beliefs, can claim control over that which nature has provided. Iwi have no more claim over water than they do to the air that we breath. Other than for prudent management purposes for the benefit of all users of water, be they human, flora or fauna, water must remain under the control 'of the people, by the people, for the people' as a basic tenet of a democratic society. To proceed as this government seemingly intends will surely lead to their downfall., and that of any future government that might venture to stray from the principles of democratic government! One law for all. One electoral Roll. We are all New Zealanders only one voting roll is required. I have mailed a print of this small letter to a number of members of parliament. All acknowledged my mailed letter. That's all. They fail to reply. Can you run a poll on this subject? "One electoral roll". Parliament is currently debating a Private Members Bill on Affordable Healthcare. One of the issues being proposed is Government paying over-65's who have Private Health Insurance a 25% rebate on their premiums up to a maximum of $500 a year. The reality for anyone paying for private Health Insurance is that once you reach the age of 60, the premiums suddenly escalate every year. After paying into it for 40 years I have now had to reduce my cover and take the maximum excess in order to still be able to afford it, but if I live much longer I can see the day coming when I'm going to have to cancel it. The irony is that if I then become reliant on the public Health system, and am lucky enough to get to the top of the seriously oversubscribed Waiting List and end up in a Public Hospital for surgery, me occupying a bed there will cost the taxpayer $800 PER DAY PLUS TREATMENT COSTS!!!! So the Government has a choice. It can pay $500 per YEAR rebate on my Private Healthcare Premiums, or $800 per DAY if I end up in Hospital under the public system. PS: My medical insurance covers me for Surgical Procedures including Cardiac, Hip replacement etc etc up to $100,000 per operation, as well as Cancer treatment up to $60,000 per year. If I end up in the Public system, the taxpayer will foot the bill. I have emailed Jonathan Coleman and my MP urging them to support this part of the bill. It won't just benefit me - me and others like me not becoming a burden on the State will benefit everyone who doesn't have private Health cover as well. It is a waste of time (and money) voting in the first referendum to choose a flag to replace or present flag. One thing that has been ignored is the Union Flag shown on our flag represents the countries that make up The United Kingdom, Ireland, Scotland, Wales and England. This has been ignored as our roots are considered of no value. Also what about the Hawaiian flag? The 50th state of the USA has the Union Flag incorporated in its flag. Funny, John Key seems to totally ignore this, as do others. I was surprised to see how many designs included the stars of the southern cross. They are untidy looking and most of the world would not know the relevance. The NZ flag is old fashioned and is far too much the Aussie one. I would like to see 2 white sections with a black section in the centre, in the same proportions as the Canadian flag, with a large silver fern in the black in the black section. Such a design would be striking, modern and immediately recognisable as New Zealand's. Do I have any supporters ? - Are hypercritical of the success of others. They are sceptical of profit makers yet all profit from their own time often with very little input. Intentionally or not their purpose is to create Dependency rather than Independence. Yes, there are those who are seen as capitalists or believed to be capitalists and have and do mix in what are termed capitalist circles but in reality they are in dark shadows or still in the closet in their dark clothes. The best example of socialism at its self serving best is the publication "Non Dare Call It A Conspiracy" published in the early 1950s. The author offered USD 1 million to any person/s who could provide conclusive contradictory evidence. It was removed from New Zealand libraries in the late 1960s. Many will scoff at my comments. "We have never learned from History, we are very good at repeating it". A very good present example is the Global Warming later changed to Climate Change the latest new global religion preached by the UN and its scientist disciple missionaries - and can you guess who?? Regions and towns dissatisfied with a new overarching Council should take the lead from the Noosa Council and devolve from the regional Council to protect their own special character other than having a standard level playing field policy unsuitable and out of character. Rates should be reduced not increased to put pressure on Councils to manage their finances efficiently. Councils are now leading the salary race above the private sector producing the competitive situation where the private sector is put under pressure to attract good staff resulting in escalating costs and reducing competitiveness. Councils should pull back form many none core activities to which they are incompetent to offer duplicating efforts of many others. We have 150 years of record. The period between medium ice ages is about 16000 years and we were near the bottom of a sinusoidal trough at about 1900. Consequently, the slope on the rising limb of the temperature curve is going to be really steep (Al Gores "hockey stick") but this small view ignores the larger context of a 16000 year cycle.Conclusions based on 150 years of (flawed?) data for a very long term event should at the very least have very wide specified precision and more properly gain context from the ice ages of the past. Why isn't water vapour included as a greenhouse gas (GHG) ? It is the large heat capacity of water that primarily makes greenhouses warm through the absorption of solar radiation. It's probably true that man is having some effect in the same way that it is true to tip a cup of water into lake Taupo and say that you raised the lake level. What say we say that heat rather than GHG are the problem here? Would the net result be the same or different if we ignored the source of heat (geothermal, hydroelectric, coal-fired, nuclear-fired or tidal generators) and assumed for a moment that every person in the world generates about 10 kW per day and that each household in the world has a 2kW heater running 24/7. How does this compare? Are large cities modifying climate rather than the effects of the inhabitants (driving cars etc). Some reverse sensitivity: if large cities are the major players then I cannot see politicians living in their comfortable 300 m2 homes moving to 150 m2 environmentally friendly, heavily insulated buildings with small windows and using public transport to get to work. It's easier to blame someone else. The reason why the Climate Change Mitigation Protocols aren't working is that any changes Man makes are unlikely to be effective because the drivers are well beyond anything man could engineer to induce change and because the makers of the policies are unwilling to yield their creature comforts (e.g. flying in a jet to a conference on climate change rather than walking, by going by push bike and oar and sail driven craft to the final destination). Yeah, over the top irony to make a point! Thanks again for your newsletter. We need to look seriously at immigration and also work holiday visas, which seems to be a way people are getting into our country as they are all skilled and want to stay here. We have plenty of skilled workers, it just seems we have been brainwashed into thinking we haven't. Also the economy does not grow on tourism as people have been led to believe - it costs money . How many of you are aware that New Zealand has two official languages - and English is not one of them? I checked this with my local Member of Parliament Simon Bridges who replied "You are correct. There is no legislation that enshrines English as an official language of New Zealand." The wording of my petition has been approved by the Clerk of the House and Simon Bridges will present my petition to Parliament. I feel that this is an important petition as there are only two official languages of our country – sign language was made official in 2006 and the Maori language almost 30 years ago in 1987. A couple of months ago I launched the petition in Tauranga and it has done very well locally. I am also finding that many older folk are very keen to sign the petition. You can contact me by emailing petition@inbox.com or going to a website http://tinyurl.com/mraz4en (this must be downloaded to your computer to print out) or phone me on 027 233 1595. It is a page with spaces for twenty signatures but I do not expect you all to fill the page, just what you can from family, friends, neighbours. In Tauranga, some shopkeepers have placed this petition on their counters and gained hundreds of signatures and I hope that some of you will also be able to help me in this way. Perhaps you belong to an organisation or a club, or even a walking or aerobics group, or a craft group – you could take the petition form along to your meeting and ask them to also sign it. English is the language most New Zealanders use every day in general conversation, commerce, parliamentary and local government business, education, news media communication, and court proceedings, but it has no official status. Another benefit of the English language becoming an official language could be greater accuracy in the teaching and use of English. I am an ordinary citizen, a mother and grandmother, and I believe this is very important for our country. There will eventually be an online petition, but it is the signatures on the page which carry the real weight as to whether or not this petition to Parliament will be successful. We are an online community and I ask you that we pull together to ensure there are enough signatures to ensure that the government has to take notice of it. I hope that many of you will sign this petition as English is our common language and we need a good standard of written and spoken English simply to communicate, therefore we must take care of it and ensure it becomes an official language of our country. I thank you in advance, Robin Bishop. Here is yet another incident to demonstrate how entrenched APARTHEID is in NZ. My mother lives in the new Summerset by The Sea Retirement Village in Park Road, Katikati. About 6 weeks ago she saw what appeared to be a contingent of Maori Elders performing some weird ceremony adjacent her unit in a park immediately opposite the Retirement Village. A few days later, earth moving machinery pitched up and proceeded to dig up the road. She was distressed at this as she learned that the disruption, dust and dirt was to carry on for about a month while the contractors re-laid the turning bay in the park and sealed it. So she accepted it and looked forward to a speedy end to the construction prior to the winter. Then the rain started and the machines stopped. She assumed the machinery would resume when the weather fined up. But no, when the weather improved, a procession of low beds turned up and removed all the earth moving machinery, leaving an eyesore of piles of soil, mud and orange security screen. To her further dismay, she discovered the reason for the sudden departure of the machinery. Apparently some random Maori turned up and found "a shell". I concede that this may be a slight exaggeration but apparently this has given rise to the need for kaumatua to bless the site before construction can continue. Apparently said kaumatua(s) are all overseas at present and will not be back and/or available to bless the site for THREE MONTHS! Cynic I may be, but I smell a large RAT. Unfortunately I am not privy to further details but I wonder how we as a society in NZ have managed to get ourselves into this sort of PC mess, where progress can be held up on what appears to be a ridiculous, trumped up "cultural" premise. It will not surprise me to learn that money has changed hands before progress can be made to appease a prehistoric taniwha or some such mythical claptrap. This sort of extortion facilitated entirely by the APARTHEID system in NZ needs to stop NOW. The Rotorua Pro-Democracy Society has just completed three public information sessions to counter the 10 propaganda sessions offered by Rotorua District Council (RDC) officials prior to submissions closing on April 17. It is good moment to pause and reflect on events leading up to the battle for democracy in Rotorua and their implications for New Zealand. The battle has its origins in the poor quality of local governance, especially in the marginalisation of our mana whenua, Te Arawa. The iwi has a proud history of mature and considered engagement in local government and contributing in a generous and collaborative manner. Historian Don Stafford provided many examples of where nga hapu of Te Arawa contributed land to communitarian projects to build schools, a hospital, a race course, a sanatorium, and so on, with settlers raising establishment and running costs, and the central government providing capital grants. In the late 1980s the Te Arawa Standing Committee (TASC) of Council was established to provide policy advice. It had six elected members from Te Arawa and was chaired by the Mayor. By most accounts it performed very well, with most of its recommendations being adopted by the Council. In more recent years, however, its effectiveness has waned with many concluding that it had become tokenist engagement. There are three main accounts of why TASC lost influence. One is that dissension between factions within Te Arawa arrived at the table and distracted members from the common good. Another is that a new generation of leaders from the many hapu of Te Arawa started jostling aggressively for power, lacked the wisdom and patience of their elders, and attacked the institution itself as toothless, forgetting its policy advisory role and being uncritical of their own behaviour. A third account is that in recent years TASC was disrespected by Council officials, to the point of not being offered legally required access to policy making processes. In 2013, Justice Smith issued a devastating critique of RDC officials’ behaviours in the Environment Court. The Council engaged an Auckland lawyer, Tama Hovell, to conduct a Cultural Engagement Audit that was intended to construct a more appropriate relationship, and presumably, the cultural transformation of officialdom. Prior to the October 2013 local government election, ex-Labour MP Steve Chadwick campaigned for mayor against a tired regime, and, at one venue, promised a fresh relationship with Te Arawa. She also promised to hold rates, consult extensively, revitalise the city centre, and so on. She won in a landslide. Once in office Mayor Chadwick established a Working Party comprising the three Te Arawa-affiliated Councillors, Sir Toby Curtis, and the Te Arawa Standing Committee. It was quickly announced that the TASC was not to have its mandate from Council renewed, which indicated it de-legitimation, although it continued as part of the Mayor’s Working Party, and negotiated secret ‘agreed themes’ for a ‘partnership’. In January 2014, the Mayor redirected Tama Hovell to prepare a ‘Partnership Proposal’ based on the secret ‘agreed themes’. 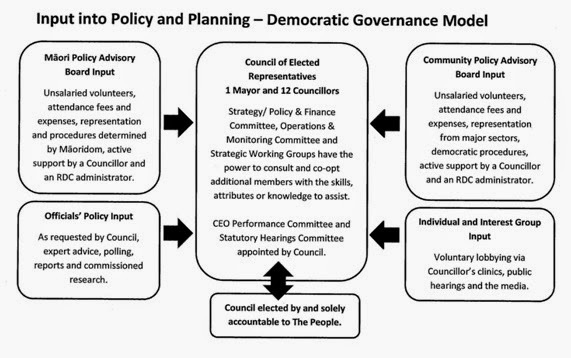 He cobbled together a wish list of co-governance mechanisms from around New Zealand that proposed direct Maori participation in Council decision making rather than enable what the LGA (2002) prescribes; contributions during decision-making processes. Political promises and preferences had significantly outstripped legal obligations. When Hovell’s Interim Report was tabled at Council in May 2014, it was promptly leaked by Cr McVicker, who rejected is as race-based representation. This was deeply embarrassing to the Mayor’s Working Party, because to that point, Te Arawa had not been consulted on Hovell’s proposals. Worse, the intense public reaction forced Working Party to refer the proposal out to Te Arawa marae, with substantial Council support mobilized by the Mayor, but increasingly triggered calls for public consultations which were ignored. Ironically, the Mayor’s regime and officials started to exhibit the behaviours that Justice Smith had described as utterly inappropriate. Consultations with Te Arawa unfolded in the latter half of 2014, led by Arapeta Tahana, one of the new generation leaders on the TASC and a holder of one of the Maori seats on the Bay of Plenty Regional Council. The Mayor and her followers continue to ignore all calls for public consultation but the dam broke in December. Cr Kent resigned over undemocratic practices in the Standing Committee chaired by Cr Merepeka Raukawa-Tait, who leads the Te Arawa Partnership Portfolio, and the instant funding of pet projects. The public were incensed by instant decisions orchestrated by the Mayor, on near split votes, to change the name of the Council, the name of Rotorua Convention Centre and to establish a Cycleway through the City. In this highly-charged context, the Mayor gave councillors a few days to consider te Te Arawa Partnership Plan (TAPP). There was little changed from the Hovell Report. It had three main features. It proposed a new Te Arawa Board that would recommend unelected nominees to be appointed by Council to four key Standing Committees of Council; two members each with voting rights to the Strategy/ Policy and Finance Committee and to the Operations and Monitoring Committee, one member to the CEO’s Performance Committee, one commissioner to the Statutory (RMA) Hearings Committee, and one member to any Strategic Planning Group established. Resistance expressed in an avalanche of letters to editors centred on power going to unelected people, that such appointments are without precedent in Rotorua, and Te Arawa-nominated commissioners would face legal challenges over conflicts of interest, at inevitable cost to the ratepayers. The second feature objected to was that such nominees would inevitably caucus and compromise elected councillors making decisions in the common good. Three outcomes were widely anticipated; disproportionate power would accumulate to one interest group, Te Arawa interests may override the public interest, and the structures would violate others’ rights to fair representative democracy. The third feature that drew angry reaction was that the proposed Te Arawa Board of 15 or 16, plus 7 nominees, plus a new CEO and a supportive administration would have estimated costs of up to $1 million per annum in a district already burdened with about $80 million of debt incurred by previous Councils. The need for a parallel governance and bureaucratic system was attacked, as were the longer-term divisive effects in what is a diverse yet broadly harmonious society. On 18 December 2014, in the presence of a large Te Arawa contingent, Arapeta Tahana tabled the TAPP on behalf of the TASC. The Mayor implausibly claimed to be neutral but her supporters used explicitly racist, sexist and ageist arguments without hindrance, violated their oath of office to serve all in the community, and openly championed the TAPP on behalf of ‘My People’, meaning Te Arawa. The Mayor manipulated meeting procedure and manufactured a 10-3 majority by using a two-part motion: That Council approve the TAPP in principle with a Special Consultative Procedure (SCP) to follow. It is not clear which part was supported by which councillors. Cr Searancke, one of the longest-ever serving councillors, was offended by its undemocratic nature, and voted against the proposal. Crs McVicker and Kent and I immediately founded the Society to defend democracy, initially with a Council advocacy, media and supporter campaigns. In January 2015, Council officials issued a draft Statement of Proposal (SOP) for the SCP. The Society found many legal flaws in the SOP, especially the degree of bias in favour of the TAPP and the pre-determination explicit in public information materials. Our objections caused a minimalist rewrite even though Cr Bentley’s questions to a leading official revealed that only verbal legal advice had been taken over the phone. The campaign of resistance broadened to contest the SOP, launch a new website and called a supporters’ meeting to incorporate the Society. The early impact of the Society’s campaign was seen in February when the Council rammed through a largely-unrevised SOP on an 8-5 vote (including Crs Bentley and Sturt). All but four Council members then withdrew from public discussion of the Te Arawa Partnership Plan at the legally doubtful threat from the CEO; that unless they could demonstrate that they did not have a predetermined position they could lose their voting rights. Crs Bentley, Kent, McVicker and Searancke ignored the CEO’s bluff but the Mayor and the other eight councillors remained silent as the CEO and teams of about 10 officials, conjointly with Te Arawa activists, offered Public Information Sessions from 10-26 March. These sessions push marketed TAPP (Option 2), hinted that Option 3 (TAPP without voting rights) might be acceptable, but deemed Options 1 and 4 to be unviable. Despite promises made by the Mayor in December, and by officials in the SOP debates, the Society’s ‘Option 5’, the DGM, was debarred from presentation. After five sessions of remorseless propaganda in favour of Option 2, the Society announced a boycott and has just finished its own series of information sessions. As noted above, Submissions close 17 April, Hearings will be held on 30 April and 1 May, and Council’s Decision will be made 26 May. The submissions process has become a shambles. Manual and online Feedback Forms were made available for submissions about the Te Arawa Partnership Model (TAPM). Both forms started with three questions. “Do you support in principle the intention to effectively partner with Te Arawa?” “What aspects of the proposed Te Arawa Partnership Model do you agree with and why?” “What aspects of the proposed Te Arawa Partnership Model do you disagree with and why?” These loaded questions were evidently designed by spin doctors to affirm ‘support in principle’ to a ‘motherhood’ statement, and then to identify factors of support and resistance they could use to explain variance in support. It might have been wiser to start with items that measured the degree of support for each of the four options considered by officials, and the DGM option proposed by the Society. And to use a qualified psychometrician to measure public preferences, if that was the purpose. The next question, “Is there another option or arrangement that you prefer and why?” was initially missing from the online version. When eventually added, the response box only permitted one line of text before automatically submitting the response without allowing any corrections. Some days later additional lines of response text were permitted. Corrections were never permitted, and since this a common feature on modern survey instruments, it suggested that the officials managing the feedback had limited familiarity and rudimentary expertise in attitude measurement. The use of four different versions of the Feedback Form at different times undermined its reliability. It also means that data collected by the different versions cannot be compounded, which the leading officials immediately started doing and announcing like a football score, presumably to influence later responses. Te Arawa activists then started offering their own highly abbreviated and fifth version of the first Manual Feedback Form through tribal networks, calling it a Petition. Worse, they added information intended to manipulate responses and used one closed item, presumably to stack the numbers. On 24 March, an organiser of the Whakaue Whakanui 2014 network reported that “less than 25% of the submissions received to date are in support” of the TAPP. She urged network members to respond to a petition which only asked one question and only permitted a Yes response; “Do you agree that the proposed Te Arawa Partnership model is an effective way for Council and Te Arawa to partner together?” Officials started adding responses to this new question to all responses to the first and different question in all versions of the Manual and Online Feedback Forms when the announced updates to the ‘football score’ as if only item had significance. When officials and Te Arawa activists were challenged about the petition on 26 March, at their last joint Information Session, the early outcomes report was quickly taken down, suggesting collusion and shame. The petition, however, continued in use and was pointed to by Facebook by one of the Te Arawa activists involved in the joint Information Sessions. Since the Petition automatically submits responses to the Council, and the ‘scores’ were updated and announced by the leading officials, it appears that these shabby practices were set up in collusion with Council officials. On 30 March, an updated version of the Te Arawa Petition appeared with two questions: Do you support in principle the intention to effectively partner with Te Arawa? Yes, No. Do you agree that the proposed Te Arawa Partnership model is an effective way for Council and Te Arawa to partner together? Yes, I agree, No, I don't agree. Each respondent was then asked to explain why he/she supported the proposed Te Arawa Partnership Model but was not asked to explain why he/ she disagreed. This eliminated any possibility of a respondent nominating (say) a Democratic Governance Model, which contradicted a promise made by the Mayor and Officials that models suggested by the public would be considered. Given that there have been four versions of the Online Feedback Form, and two versions of the Te Arawa Petition, officials’ summaries to Councillors will now need to indicate the distribution of Yes and No responses, as well as provided content analyses of responses to open-ended questions that were collected, for each version of each instrument. Compounding responses to six different versions of the instrument would offend the most basic principles of statistical rigour. Or might it be wiser to simply scrap the invalid data and employ professional psychometricians to measure the degrees of support to each of now five options, including the Democratic Governance Model? This is to assume, of course, that the purpose of the submissions is to inform democratic and effective decision-making by Councillors, as required by the Local Government Act (2002). The corruption of the submissions process, however, points to an altogether different purpose; achieving a pre-determined outcome. This helps explain why the Society has mounted parallel strategies based on voluntary contributions. Advocacy continues on Council regarding the quality of the SCP processes and instrumentation. A media / information / website / billboard campaign continues to attack the TAPP, promote the DGM, and encourage submissions. A mailout has boosted membership and encouraged submissions. A Paper Petition is underway for those on the Rotorua and Waiariki electoral rolls. An International Petition was launched at https://secure.avaaz.org/en/petition/Rotorua_District_Council_We_ask_you_to_adopt_a_Democratic_Governance_Model/edit/ A legal strategy was launched on 2 April, seeking pledges to underwrite a legal opinion prior to a Judicial Review. Sufficient pledges were received the same day. The greatest challenge in this policy battle is how to reconcile the concepts of mana whenua and citizenship in a democracy. Mana whenua appear to evaluate democracy in terms of the advantages that accrue to their interest group. Democrats appear to evaluate democracy for its capacity to reconcile the different expectations of diverse interest groups and create policy settlements on the common ground. Mana whenua insist that their claims are about culturally significant rights and responsibilities, such as kaitiakitanga. Democrats tend to evaluate mana whenua claims as attempts to achieve race-based advantages, even against matawaka, that is, non Te Arawa Maori. Hence, our Society has proposed that a Maori Policy Advisory Board, balanced by a Community Policy Advisory Board and two other forms of input (from individuals and small interest groups and expert officials), is a reasonable method of respecting and reconciling mana whenua interests with all citizens’ democratic rights. The Society’s membership has just passed 300, the number that attended the hui-a-iwi at Tametekapua in December 2014 to endorse the TAPP. Its membership includes people from all ethnic groups, including Maori, who are united in their concern with defending democratic principles and practices. Its immediate objective is to change the majority of councillors’ minds by 28 May. If not, its contingency strategy is regime change in October 2016. Readers are therefore invited to consider the implications of our battle for the rest of New Zealand and to offer support in any way they can. Kia ora tatau.